"Having lived in the culinary paradise known as Vietnam for a few years has inspired me to experiment with a variety of Asian fusion dishes; this is one of my favorites. Most of these ingredients are abundant in the US as well as in Vietnam. 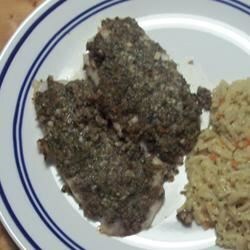 This unique pesto gives the Tilapia a tantalizing flavor. Hope you enjoy!" Preheat oven to 400 degrees F (200 degrees C). Lightly grease a 9x13 inch baking pan. Combine 3 cups arugula, garlic, pecans, olive oil, 1/4 CUP Parmigiano-Reggiano cheese, black pepper, and lemon juice in a blender and blend until it reaches the consistency of a pesto sauce. Spread 1/2 cup arugula on the prepared baking pan. Place the tilapia fillets on the arugula. Spread the remaining pesto generously on top of fillets. Sprinkle 1 tablespoon Parmigiano-Reggiano cheese on the pesto. Bake in preheated oven until fish flakes easily, about 20 minutes. 20 minutes to bake a tilapia fillet is waaaay too long. Your fish will be overcooked. I recommend about 8 to 10 minutes in a pre-heated oven. Delicious! I used 1/2 arugula and 1/2 baby spinach. So healthy and really yummy! Great Recipe. I used baby spinach instead of argula and it turned out awesome. Served this to my in-laws who don't eat fish very often and they loved it. My husband gave it an "A" rating The pesto part could get a little strong on the garlic but we liked it that way. This is good, but it seems to be missing something. Salt, maybe? I was hoping for a little more flavor. The arugula did end up tasting like spinach and it overpowered the other ingredients. This was so good it inspired me to try growing arugula in my own garden!